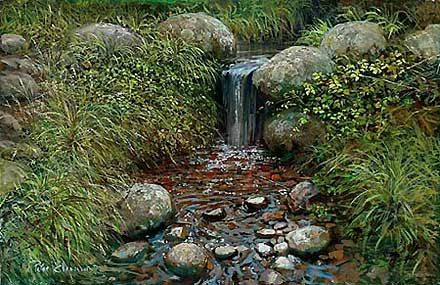 Peter Ellenshaw Handsigned and Numbered Limited Edition Giclee on Canvas :"Rivulet"
About the Artist : Peter Ellenshaw, whose artistic career spans more than six decades, is a renowned landscape artist, motion picture art director, Academy Award.® Ellenshaw was born in Great Britain in 1913. A neighbor, Walter Percy Day, O.B.E., a famous matte artist of his time, discovered Ellenshaw's talent and took him on as an assistant. Mattes are realistic paintings done on glass, against which films of actors and other parts of the set are projected; then both painting and film are re-photographed to create a new, realistic image. Ellenshaw regarded Walt Disney as a source of inspiration, a wonderful executive, and over the years, a good friend. "Walt had the ability to communicate with artists," recalls Ellenshaw. "He'd talk to you on your level - artist to artist. He used to say, �I can't draw, Peter.' But he had the soul of an artist, and he had a wonderful way of transferring his enthusiasm to you." In 1953 the Ellenshaws moved from Great Britain to the United States where Peter began working full-time for the Walt Disney Studios. Ellenshaw maintained his identity as a traditional landscape artist during his Disney years and always found time evenings and weekends to work on his own canvases. One of Ellenshaw's first Disney projects upon his arrival at the Studio was to create a conceptual rendering of something called "Disneyland." Ellenshaw went to work painting an aerial view of the proposed park on a 4' x 8' piece of fiberboard. The painting was then used by Walt Disney to help introduce television audiences to his new project, while simultaneously using the painting to attract backers on this exciting new concept in outdoor entertainment. In 1964 Ellenshaw won the Best Special Visual Effects Academy Award.® During his amazing film career, Ellenshaw has been nominated for four Academy Awards.® In 1993, Ellenshaw was officially designated a "Disney Legend" by The Walt Disney Company during a ceremony at The Walt Disney Studios officiated by Michael D. Eisner and Roy E. Disney.